ATLANTA, Ga., (October 21, 2011) – For more than six decades, generations of Atlantans have welcomed the holiday season with the lighting of the Macy’s Great Tree. The tradition continues this year as American Idol Season 10 winner Scotty McCreery takes the stage to partake in the tradition. The stars will shine bright Thanksgiving night with performances by Grammy Award winning gospel duo Mary Mary, Season 8 winner of So You Think You Can Dance and Georgia native Melanie Moore as well as 2011 rising star Erica Nicole. The lighting of Atlanta’s most beloved and recognized Christmas tree will take place in front of Macy’s at Lenox Square Mall from 7 p.m. – 8 p.m. on Thanksgiving night, Thursday, November 24, 2011. A pre-show concert featuring behind the scenes interviews and exciting performances by the evening’s entertainers will begin at 6:15 p.m. The celebration will be capped off with a fantastic fireworks finale set to holiday music – a moving and memorable way to kick off the holiday season! Scotty McCreery: America first fell in love with Scotty McCreery in 2011 when he appeared on American Idol and immediately made a name for himself with his deep and undeniably country voice, strong sense of self, small-town roots, and unwavering integrity and conviction. In May, he won Season Ten of American Idol when a record-breaking 122.4 million votes were cast for the finale and nearly 39 million people tuned in to see the winner’s name announced. Then shortly after he starred in the American Idols Live! Tour, which Pollstar ranked as one of the nation’s Top 15 tours. On Oct. 4, Mercury Nashville/19 Recordings/Interscope artist Scotty McCreery released his debut album Clear As Day, which premiered at No. 1 on the Billboard Top 200 and Top Country Albums charts, making him the youngest male in history to open at the top of the all-genre chart with a debut release. This was also the highest first-week album sales of any solo country artist in 2011. The album’s gold certified debut single, “I Love You This Big,” became a Top 15 hit and enjoyed the highest-charting debut for a new artist since at least 1984. The video for the song also hit No. 1 in just a week after its release. Clear As Day is the perfect title for Scotty McCreery’s debut country album because this impressive collection of songs clearly and vividly captures who Scotty is as an artist and a young man. While recording the album, Scotty was driven by the desire to blend the best of both musical worlds – classic and contemporary – to create a fresh sound that is simultaneously new and timeless. The album explores the big philosophies and small details that define life in America, especially the small towns that can sometimes feel confining to teens with a powerful wanderlust for places unseen. With songs such as “Out of Summertime,” “Write My Number On Your Hand” and “You Make That Look Good,” the album depicts the intoxicating excitement of the coming-of-age years, such as the anticipation of Friday nights, the intrigue of meeting a pretty girl and the thrill of exchanging class rings. An estimated 15,000 people attended his Album Release Party Homecoming Concert and Birthday Celebration in Raleigh, N.C, on Oct. 8, the day before his 18th birthday. He performed several songs from his new album, including his current hit, “The Trouble With Girls.” Scotty is currently completing his senior year in high school. Check out today’s New Country Challenge! It’s Phil Vassar vs. Scotty McCreery. Check out today’s competition and then VOTE! Look who's got 2 videos on CMT Pure 12-Pack Countdown! Way to go Scotty! Head over to CMT & Vote today for The Trouble With Girls & I Love You This Big! 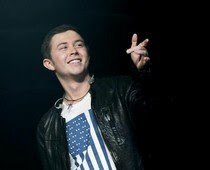 ‘American Idol’ winner Scotty McCreery has been on fire since the moving on from the Idol stage. McCreery’s new album ‘Clear as Day’ has snagged the number 1 spot on the Billboard charts and just recently he had the honor of singing the National Anthem for Game 1 of the World Series of baseball. Now it has been announced that Scotty will be joining Sugarland, Sara Evans, Zac Brown Band and Martina McBride as a performer at the 2011 Country Music Awards in Nashville next month. At this time it is not known which song Scotty will be performing at the awards show, but it’s likely he’ll sing one of his more well known songs. Carrie Underwood and Brad Paisley will be co-hosting the 45th annual CMA Awards making it their third time as hosts for the event. Will you be watching? 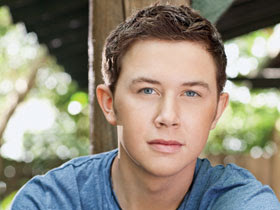 The trouble with girls, says Scotty McCreery, is that nobody loves trouble as much as he does. So even when said girls are a mystery and a puzzle and so dang pretty and are busying stealing you with hello and killing you with goodbye, he still loves them. "They're funny ... you know? You just never know what they're thinking, and they never know what we're thinking as guys, but that's what kinda makes that relationship thing and the girls and boys thing pretty cool," McCreery said in a recent radio interview. "So it's kind of like a little puzzle. Like the song says, you've just gotta figure it out sometimes." And figure it out we will now that his "The Trouble With Girls" video has debuted on CMT. I think I like it already. The label insists that the 'Star-Spangled Banner' lyrics Scotty sang at the World Series Game 1 sounded a bit different due to his southern accent. 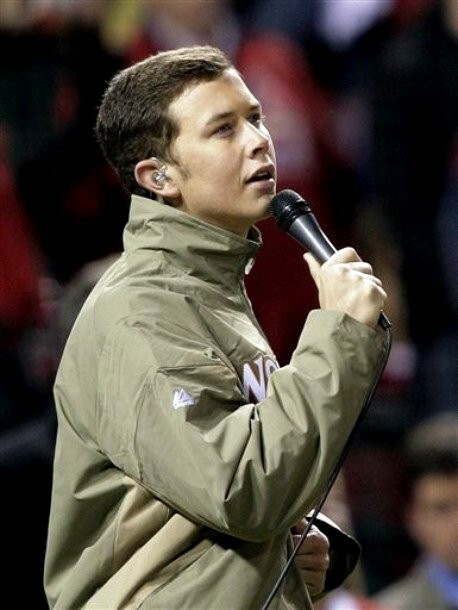 Scotty McCreery didn't change the lyrics of "Star-Spangled Banner" when singing at World Series Game 1, so Universal Music Group Nashville says. The label fights report that the "American Idol" winner flubbed the national anthem at the October 19 event, stating "This is nonsense." "We heard him sing the song live and have seen a taped version of his performance several times. He sang the lyrics correctly as they were written by Francis Scott Key," the company issues statement to Lifeline Live. "And we would bet most folks with a Southern accent would agree with us." Scotty belted out the patriotic song before the Texas Rangers faced off the Cardinals last Wednesday. The "I Love You This Big" hitmaker opened the game with brief awkward silence due to mic malfunction, but he started over his performance smoothly soon after the problem was fixed. Media quickly took a note that the lyrics Scotty sang sounded a bit different, prompting rumor that he flubbed the national anthem. The lyrics were supposed to be "O say does that Star-Spangled banner yet wave...," but he sounded to sing "No Jose does that ...." First Lady Michelle Obama was present at the game. Scotty himself hasn't responded to the rumor. Instead, he wrote on Twitter, "Well, as mr George Strait would say, I wasn't here for a long time, but I was here for a good time! Great time in St. Louis yesterday!" A few hours before, he posted, "I am sooo pumped to be singing the anthem tonight!" Regardless of the talk surrounding his "Star-Spangled Banner", Scotty actually had made sure he didn't make any mistake. "I am practicing every day," the 18-year-old country music told Zap2It. "My mom's making me write down the lyrics on a piece of paper. And that's how I study. That's the way to learn." TICKETS FOR KANSAS ARE ON SALE THIS AM AT 10 WWW.LIVENATION.COM SEARCH SCOTTY MCCREERY FOR DETAILS AND PURCHASE INFORMATION. After recently wrapping his highly successful 2011 tour Brad Paisley has announced his tour for next year – “The Camobunga! 2012 World Tour” presented by Chevy. The tour kicks-off Jan. 12 in Grand Rapids, MI with special guests The Band Perry and Scotty McCreery. “Camobunga :n; : //kam,bunga/ - The name of a live musical tour experience. A mind blowing blend of country, fiery 60's surf guitar acrobatics, futuristic special effects, retro heart and soul, and mind altering liquid beverages. The spirit of the deep woods meets the breakneck excitement of the California coast. Mercury Nashville/19 Recordings/Interscope artist Scotty McCreery's debut album, Clear As Day, premiered at No. 1 on the Billboard Top 200 and Top Country Albums charts, earning the highest first-week album sales of any solo country artist this year. He is the only new country artist to debut at No. 1 on the Billboard 200 this year. The album contains his Top 15 hit, "I Love You This Big," which had the highest debut on the Billboard Hot Country Songs Chart for a new artist's first single since at least 1984, and his current hit, "The Trouble With Girls." He recently completed the successful American Idols Live! Tour, which Pollstar ranked as one of the nation's Top 15 tours. Live Nation is the national tour promoter. Log on to www.bradpaisley.com and www.livenation.com for on-sale and up to date information on dates to be added. Are you the ultimate country fan? Hailey posted this before but I wanted to re-post in case anyone hadn't seen it the first time. The Grand Prize is a trip for 2 to a concert & a M & G with Scotty, plus more. 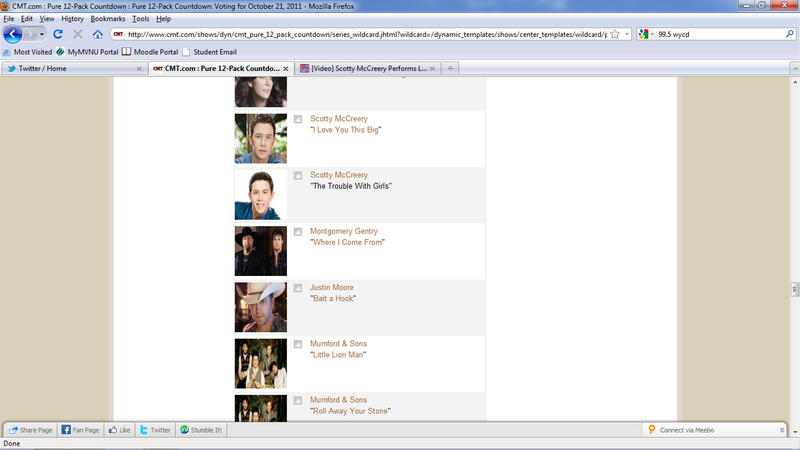 Scotty WILL be performing at the Annual CMA awards! Here is what was just posted on Scotty's official site! Scotty McCreery will be performing at the 45th Annual CMA Awards on November 9 at 8/7c on ABC. Tune in to watch!